These areas were first explored by field researchers of the National Museum in the years 1970-1971. One of the foremost Filipino anthropologists, Dr. Jesus T. Peralta, subsequently made a report about the survey study. Also, it is important to note that one of the field anthropologists sent by the National Museum at that time, Dr. Erlinda M. Burton, has stayed behind in Cagayan de Oro since then and has continued to make important scholarly studies of the local culture of Mindanao. 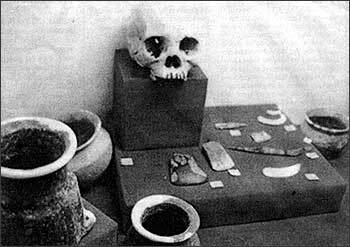 Among the numerous artifacts uncovered at Huluga were human skeletal remains, fragments of which were eventually sent to the Scripps Institution of Oceanography of the University of California at San Diego near La Jolla, California where amino acid racemization dating technique dated it as belonging to 350 AD. The scientist who conducted the dating test was the world famous Dr. Jeffrey Bada who was the prime developer of the amino acid racemization. Today, both caves at Huluga have been left in their primordial conditions. Each cave is marked with a National Museum code number. The first cave is marked with the code “NM X-91-R2.” The Open Site is code numbered “X-91-Q2”. Many artifacts, on the other hand, are presently part of the Museo de Oro collection at Xavier University. Moreover, the archeological records division of the National Museum in Manila continue to keep the records of the site for continuing scholarly studies. Meanwhile, local historians continue to monitor the Huluga area. The last surface scans conducted at the site took place last March 4, 2001, April 25, 2001, May 1, 2001, and May 11, 2001, all of which continued to yield prehistoric potsherds and volcanic obsidian flakes or stone tools. Lately, some of these flakes were analyzed by UP archeologists who concluded that they bore signs of having been used as stone tools in prehistoric times. How important is the Huluga Site to Cagayan de Oro? Aside from its continuing archeological yields, the Huluga Site is believed to have been the site of prehistoric Cagayan known in written historical documents as “Himologan.” When the Augustinian Recollect friars arrived in Cagayan in the year 1622, there was as yet no Cagayan town in the present area that exists today. There was only a fortified cave fortress called Himologan. It was only in the years 1626 thereabouts that Himologan chief Datu Salangsang and his people were persuaded by Fray Agustin de San Pedro to move the town site to the present Gaston Park – St. Augustine Cathedral complex. Huluga, therefore, is prehistoric Cagayan. In 1999, the city administration of Mayor Vicente Y. Emano started pursuing plans for a bridge to span across the Cagayan River, from Taguanao to Upper Balulang. However, it was found out by local historians that the bridge would, in fact, demolish the very site of the Huluga Caves. This brought to the fore two things: that apparently, city officials were ignorant of Huluga, and that planning large-scale infrastructures without proper consultations was a modus operandi of the Emano administration. A hasty survey trip was organized by Councilor Maryanne Enteria in June of 1999 and Dr. Burton herself was invited to join the trip. Staff from the City Engineer’s Office, City Planning and Development Office, City Tourism Office, and the City Historical and Cultural Commission were also part of the team, and it was they who verified to the councilor and to Dr. Burton that indeed the site faced the danger of destruction. Immediately, Councilor Enteria made a verbal recommendation to Mayor Emano to order the diversion of the bridge so as to avoid the Huluga area. At the same time, Dr. Burton also expressed the recommendation that what was also important was to avoid any heavy construction within a radius of 2000 meters within the Huluga area. In the afternoon of the same day, Councilor Enteria verbally relayed the news that Mayor Emano has promised to divert the construction. At that point, that was the best assurance obtained, indirect and verbal. In the ensuing time, bidding was supposedly conducted and initial groundbreaking activities were done by the awarded construction company. In the light of the Emano promise, it was assumed that the Huluga area was to be preserved for posterity and respected by city hall. The contrary is, however, true. Recent inquiries made by local historians as well as field works in situ uncovered so many situations anomalous to the preservation of this prime patrimony of Cagayan de Oro. The three offices consulted were the City Planning and Development Office, General Information Service, and the City Engineer’s Office. It was the City Engineer himself, Mr. Jorie Bingona, who admitted that indeed there was no map available. Bingona identified the construction company as White Horse Trading, Development, and Construction Incorporation with office at Cruz Taal St., behind Roket Theater. A subsequent visit to the White Horse office was made. Company staff admitted that they had no map. Not only that, they said that Mayor Emano nor any city hall official appraised them of the historical value of Huluga. They, in fact, expressed surprise about it. 2. From a visit to the site, it is obvious that Mayor Emano did not bear in mind Dr. Burton’s recommendation that no heavy construction be done within a 2000-meter radius of the Huluga cave area. The eastern side approach to the bridge, in fact, is just well within less than a thousand meters from the cave. Aside from possible structural damages to the caves, that would also mean that the caves will now be accessible to people, including possible looters, treasure hunters, etc. 3. The worst pummeling being done to the site is where there is known as the Huluga Open Site. This is the site that continues, even today, to yield archeological artifacts. A big portion of the southern and eastern side of the Open Site will be bulldozed to give way to the road. At present, trees marked with a red “x” and other markers are already observable at the site. It is very likely that aside from permanent damage that will be done to the Open Site, earth will be moved and dumped to the rest of the site. It will be noted that no pits were ever dug by scientists at the Open Site but only surface scans. It is therefore possible that the site will yield still unearthed artifacts and evidences of prehistoric Cagayan culture. This was in fact one of the recommendations of the National Museum team. 4. Obviously, Mayor Vicente Y. Emano did not hold any consultations with people who have the proper professional knowledge about archeological sites such as Huluga. Even though verbal assurances were given by Emano in 1999, nonetheless these were reneged by him. At the least, these were not, in fact, put on writing. 5. Probably the most glaring violation done was the fact that the project did not undergo the proper environmental procedures. During the May 11, 2001 field survey which was accompanied by regional officials of the DOT, DENR, and DPWH, government employees from the Environmental Management Bureau admitted that no Environmental Impact Assessment was applied for by the project proponents. Hence, no Environmental Clearance Certificate was ever issued for the project. At this point, it may still be possible to divert the road being built at the Huluga Site. Local historians and anthropologists are not against the development of the site for increasing the road and access network of urban Cagayan de Oro. However, the preservation of such an important archeological and historical site in Mindanao can still be achieved without hindering the work of necessary progress. Had consultations been made, Mayor Emano and his councilors would have known about the significance of Huluga as they were already sounded out about it as early as 1999. This fiasco in fact speaks a lot of the attitude problems of the present city mayor and his administration councilors towards the value of popular consultation. Finally, it is probably imperative now for city hall to institute infrastructural protection measures of the Huluga Caves which will now be accessible to people, thereby opening it to possible damage, looting, and vandalism. Apparently, city hall has no such plans. The area below the mouths of the cave, a piece of land composed of alluvial deposits reportedly belonging to a DENR official by the name of Quililan, would be a potential tourism site that the City can develop in memory of its prehistoric inhabitants. The site is along the river banks and is immensely shaded by trees. This is also the site where the two Recollect friars were believed to have landed ashore after sailing for some days from Butuan. This is therefore a historical site that the City can mark with a historical marker. From this alluvial land, platforms and steps can be constructed to bring one up towards the mouths of the caves. Hence, that will be a tremendous source of historical education and patrimony preservation for our City, not to mention tourism revenues. If at all, the Emano administration merits negative ratings in the field of history and heritage preservation. Is it because the work of historical and heritage preservation does not seemingly appear to be a gut issue and is not a generator of much needed votes? Article was written in 2001. In 2002, the contractor White Horse Trading was replaced by UKC Builders. Date of female skull corrected to "350 AD" in 2009. For more updates, see the primer, or send email to the author. Article published by the Heritage Conservation Advocates, Cagayan de Oro, Philippines, July 30, 2001.